This nation is about to be turned upside down with something that is unstoppable. The Lord says the safest place to be is with your face down…in the water. In two dreams in the last 2 months, I saw something that is coming, I believe to this nation that will be inevitable and unstoppable. It will turn everything upside down, but He is showing us what to do as well as what His redemptive purposes are. 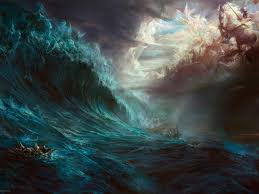 In the first dream I saw a wall of water to my left at least 12 stories high. Not only was it moving quickly, but it was ALIVE – fierce and foreboding. There was a force behind it and I knew that no one could stop it and no one could run from it. To my right I saw a parking deck already crumbling from the first wave of water. I saw people in their cars falling out of the parking deck into the water hoping to float away. Instead they quickly sank in the rising water. I wasn’t afraid. I simply realized there was nothing I could do but prepare and brace for it. There was a child with me and I tell her that the safest place to be is to lay down with her face in the water…and rest. I see others running but it’s useless. I see the enormity of it all. Though, at the time, I knew this dream was foretelling something big that was coming, I didn’t understand the context or purpose until a month later when I had a similar dream. In the second dream I was in a massive ship that was known to be strong and secure. Though guards were posted to watch over the ship, something even larger and more powerful than the ship was able to sink its claws into it and lift it up out of the water. It happened so quickly that no one was ready for it. I had the feeling of being turned upside down and then thrown back into the water. I woke up preparing to drown. As I reflected on these dreams, I realized that I was not fearful in either one of them. Though it was evident that something huge was about to happen, I was at peace and simply knew I needed to prepare. I believe this is the main point of these dreams. This nation is not the safe and secure anchor we once thought it was.Whatever is coming, the Lord is showing us the need to get ready, both personally and corporately as the Church. The people in the parking deck represent many people who are simply “parked” where they’re at, not moving forward or growing in their walk with the Lord. Their routines and presumed comfort will crumble when the floods come in because they haven’t been building their faith or strengthening their spiritual foundations. To be rightly positioned, we must be actively pursuing God’s heart and purposes in this season and not assume our safety or security in anything man-made. I also believe the Lord would have us increase our alertness in the spirit and learn to better discern the times we are in. We may think we are “unsinkable” as a nation (the huge ship) but there are forces at work in the unseen realm that are working very diligently – and secretly – to overwhelm and overthrow us. We must pray in the Spirit in order to build up our faith as well as deepen our prayer life to detect the enemy’s advances and schemes. Even in all this, God is speaking encouragement to us! God’s directive is in the first dream when I told the child to put her head in the water. It wasn’t until after one of our “soaking times” at church that I understood what this meant. We use the term “soaking” to mean spending time in quiet worship, resting and listening to the Father’s heart. Often times we end up with our faces to the floor as we continually humble ourselves in prayer. I believe the Lord is saying that this is the safest place to be right now – with our heads down “soaking” in His presence, learning to rest and trust in His unfailing love and overcoming power. It is only when we get in His presence that fears are stilled and our hearts and minds get saturated with His supernatural power and grace. We must not run in fear or deny what’s ahead. Regardless of what change is coming, be it economic, political or even ground warfare, we must be prepared for it. When the ship does get turned upside down, there will be countless people looking for safety and refuge. We must become a Church that learns to rest in His presence, humbling ourselves before His throne and living in the absolute confidence of His protection and His victory over every dark force. The world will ultimately depend on it. 5 Comments on Are You Prepared for What’s Coming? The vision I had just after midnight, a couple of seconds into the new year of 2015 lines up with this. It was raining and there was a huge lightning flash followed by the loudest thunder crash that I have ever heard. In the vision that followed I saw a huge dam breaking to my left and felt the spray of water on my face. The wall of water was extremely high and powerful and I saw it way above me. I saw it’s amazing power and force as it broke free from the dam that held it back up till now. I knew that this was something big and global. I knew that the Almighty was breaking something or setting something loose in the spiritual realms in 2015. I knew that it was a process that would happen over the year. All through this year it has been as if I have been standing against the world. In the last week after crying out to Abba Father in frustration everything became clear to me, when I saw what evil has been happening in the mega churches all over the world and now becoming very real very quick. Although this was very upsetting I also was shown Scripture that He controls everything and I knew that He was setting this evil free. That was a wake up call to me. Isa 45:6 that they may know from the rising of the sun, and to the sunset, that there is none besides Me. I am Jehovah, and there is none else; Isa 45:7 forming the light and creating darkness; making peace and creating evil. I Jehovah do all these things – I knew that this change was for the good. It is as if people are blinded to the Truth and are seeking out churches that tell them what they want to hear with a watered down gospel who only want their money. He has given them what they want. There is a spiritual clarity and confidence that I have received in that I know that I need to trust in Him only and not in anyone else and also clarity in discerning His instruction from the fluff and to rely on what I receive and don’t doubt, but discern. I also know that everything that is happening is from Him and He is in control….. In hindsight it was clear that It was a process and was revealed over the year looking at what has been released on the world through ISIS, the refugee crisis and world tensions. It’s not just a nation that will be turned upside down, it’s the world. The world has had a sort of peace for some time after the awful world wars of the 20th century. I grew up in the shadow of world war 2, even in the 60s this shadow hung over us plus the cold war and all that. Since then the world has changed dramatically – but not for the better and I wonder what the world will be like in another 30 – 40 years? With all the sin and perversion……..Our fathers and grandfathers generation who were largely more God fearing and yet suffered so much……..What of this generation? Can God stand by and not act? Thank you Wanda for sharing.